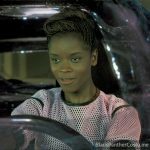 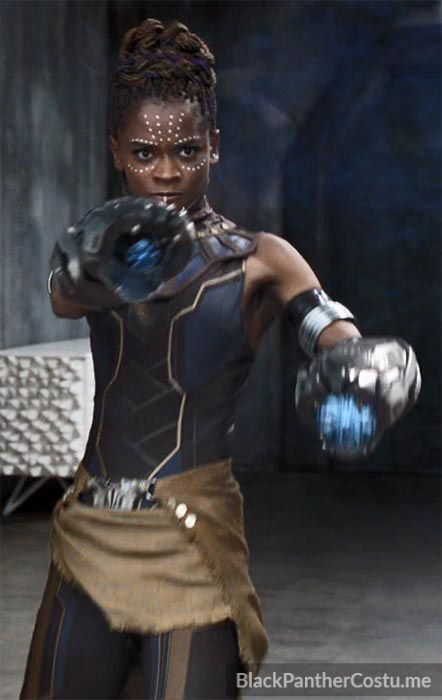 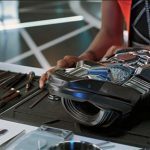 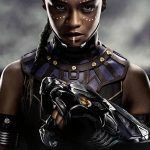 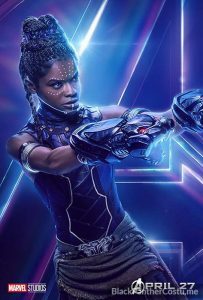 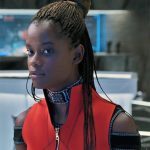 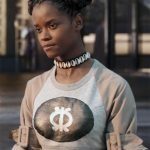 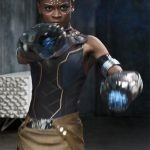 Shuri is T’Challa’s sister and chief technology officer of Wakanda. 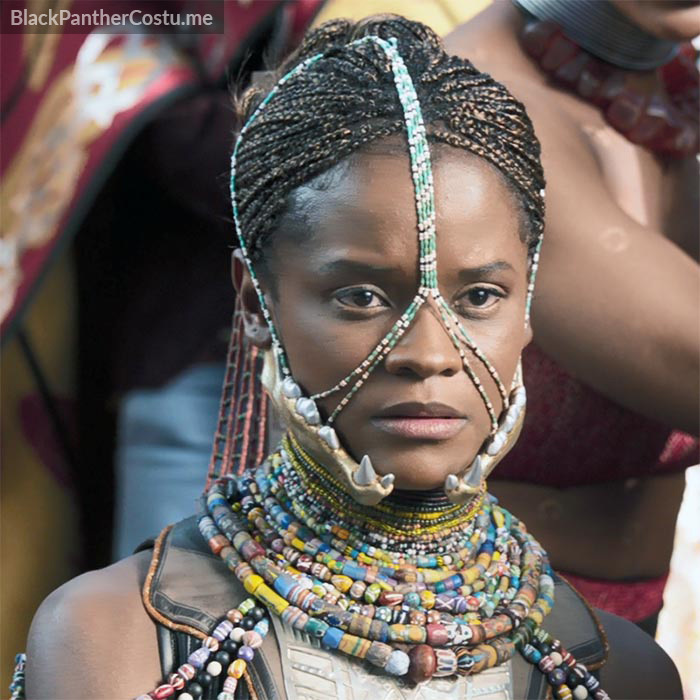 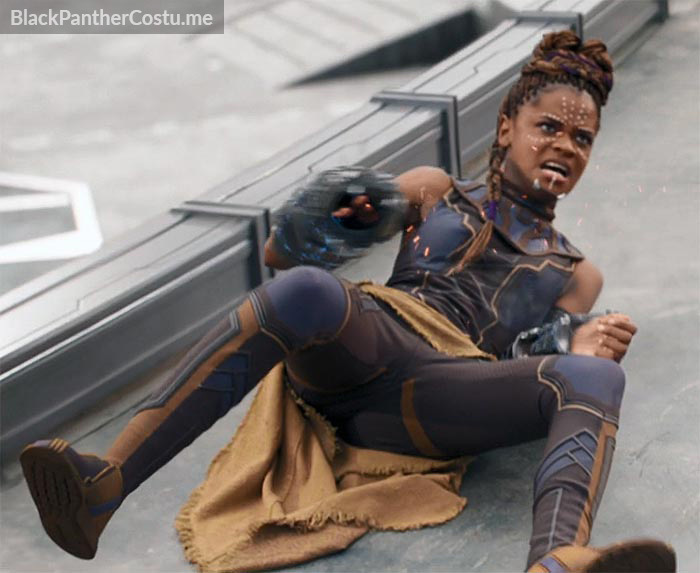 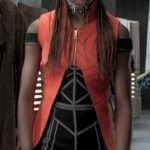 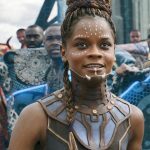 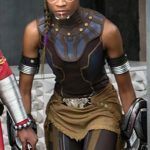 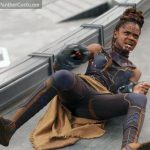 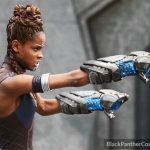 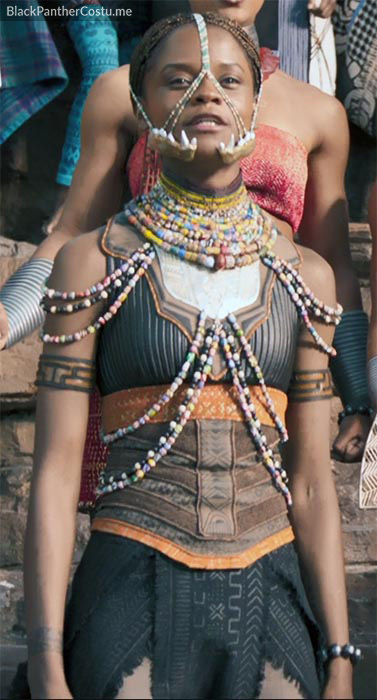 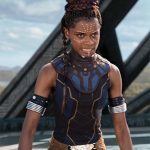 Shuri wears quite a lot of outfits in the Black Panther film. 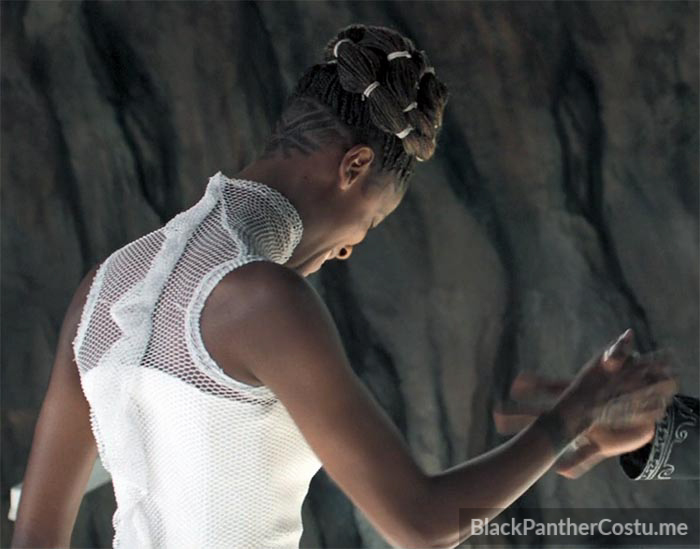 It seems like she was the main outlet for costume designer Ruth Carter’s creative indulgences! 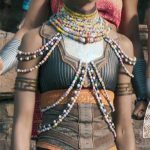 Character is uncomfortable in traditional outfit. 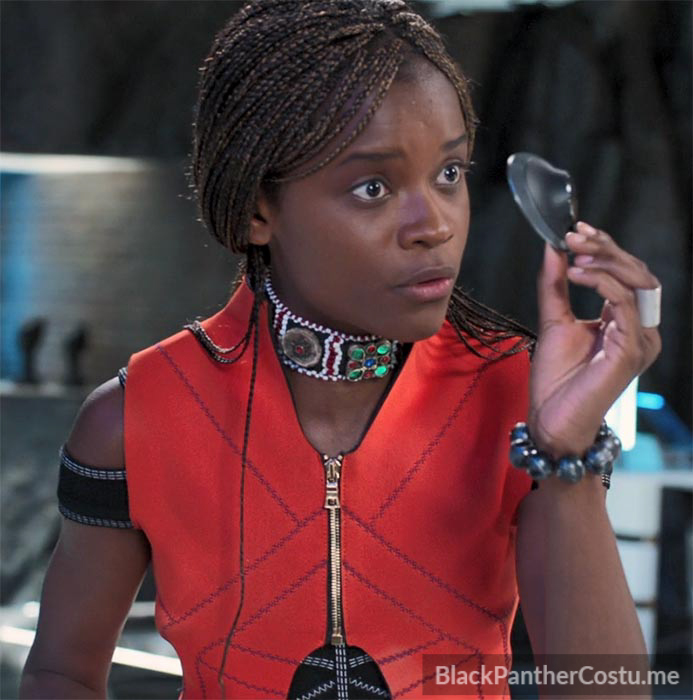 “At this point, I knew our time was drawing to a close with Ruth, so I asked a question I’ve had since the first images of Princess Shuri in an orange-red vest had been released. 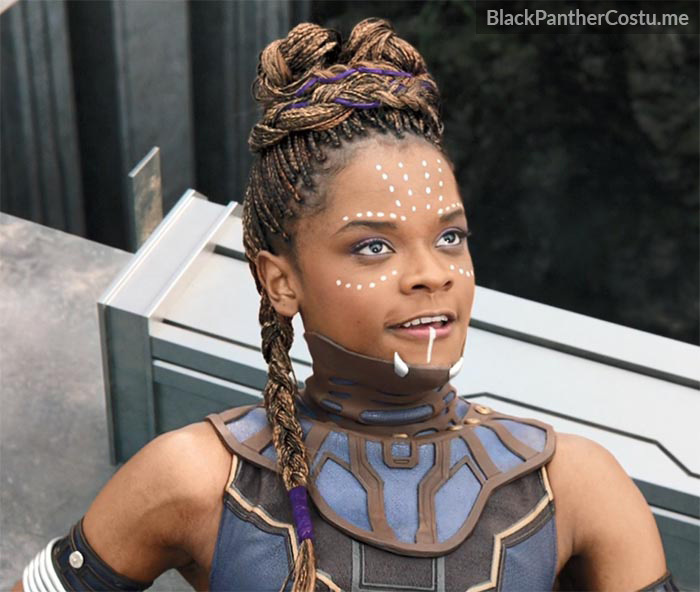 “Was that intentional maybe? 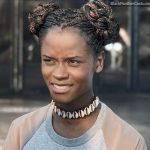 Because we know that Robert Downey Jr. has pretty much confirmed that he’s done after this round of Marvel movies, and wouldn’t Shuri just be the most badass Iron Man ever?” I continued. 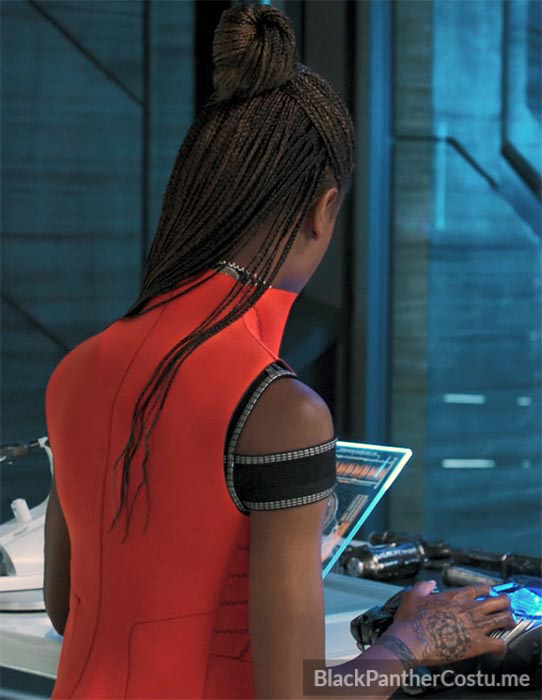 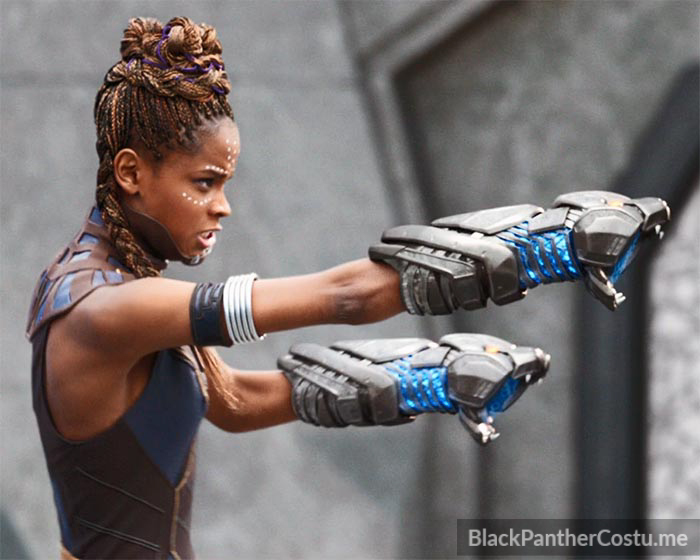 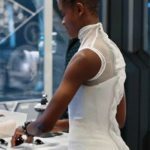 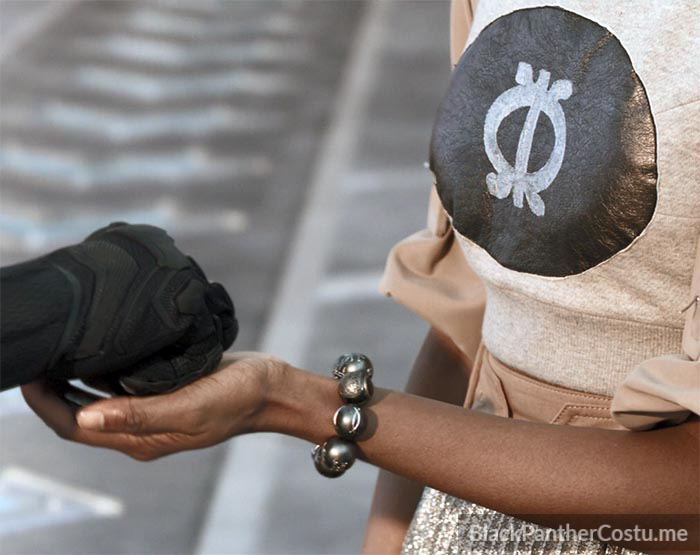 “It was a big challenge for me to come up with a wearable lab outfit that would fit the character of Shuri. 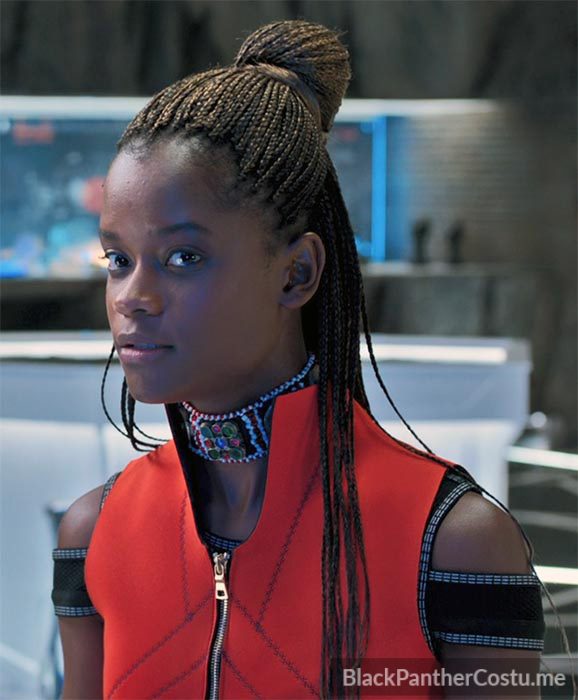 She’s the young designer genius of the Wakandan Design Group and she’s very forward-thinking, so I don’t see her wearing a standard lab coat. 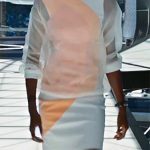 At first, I started to poke around at some of my favorite designers. 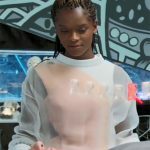 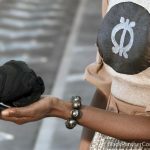 I looked at Rick Owens, Gareth Pugh and Stella McCartney, because I feel like they are always thinking ahead and they are always coming up with ideas that are very unconventional. 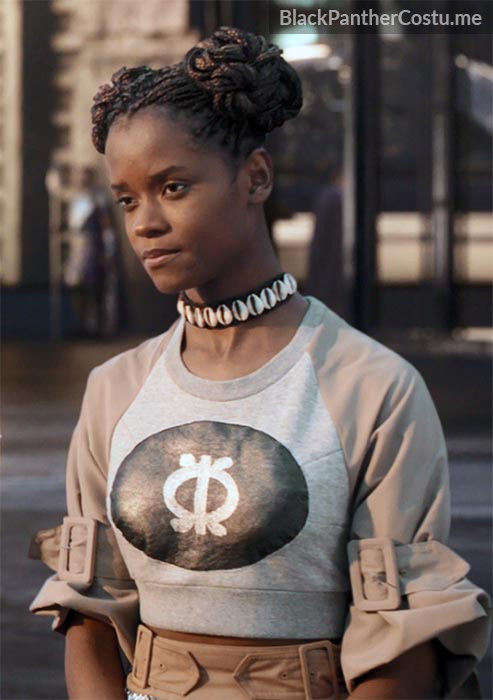 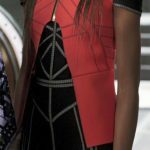 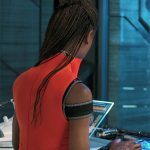 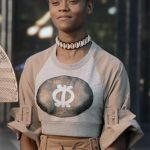 I was heavily inspired by Stella McCartney’s ability to recycle fabrics, and the idea of taking recyclable materials and creating new fabrics—and that’s when I decided that Shuri’s lab look should be a simple dress with an overlay. 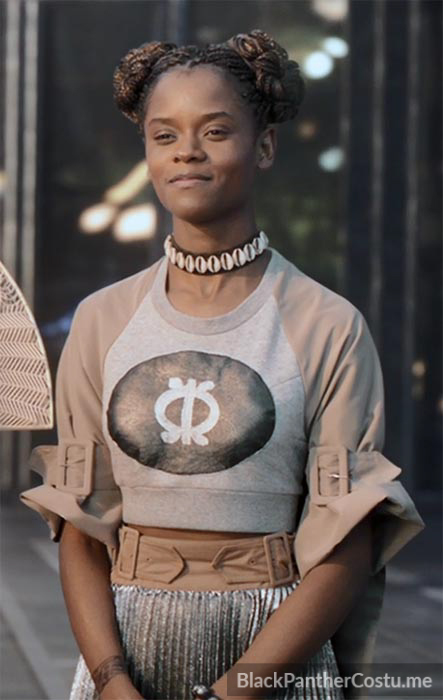 “I decided that the overlay would a type of material that is protective, cool and fun. 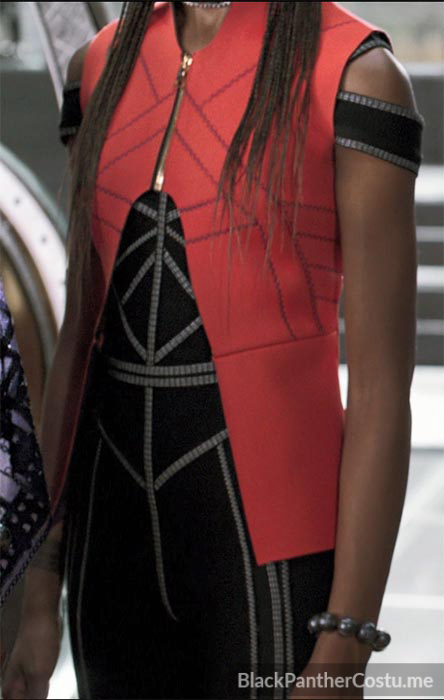 I felt like it should look like it was made from recyclable fabric or recyclable materials. 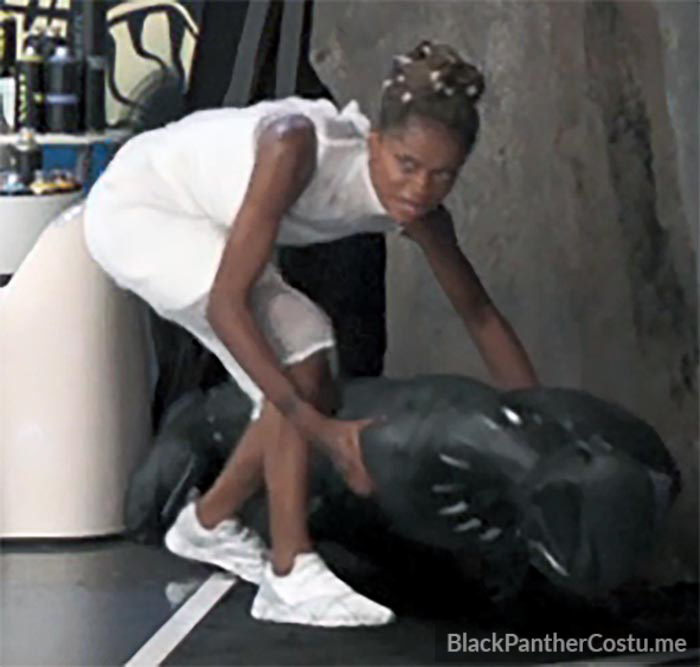 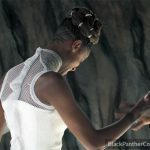 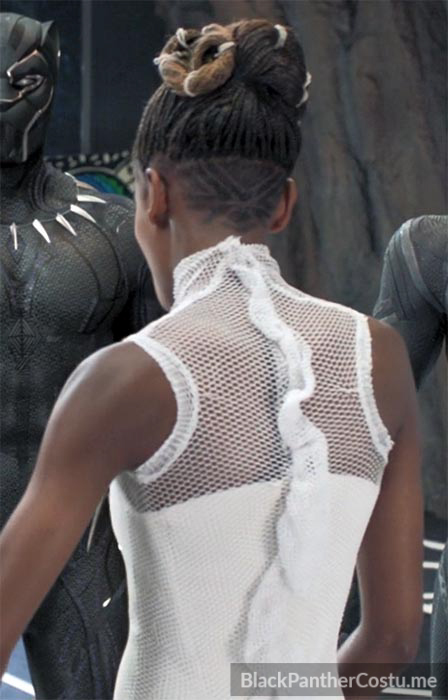 The first dress we see Shuri wear is a white dress with a mesh overlay. 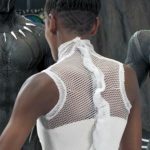 Overlays look like they are protecting the fabric that’s underneath, or they create a story of their own, so most of her costumes have these protective layers. 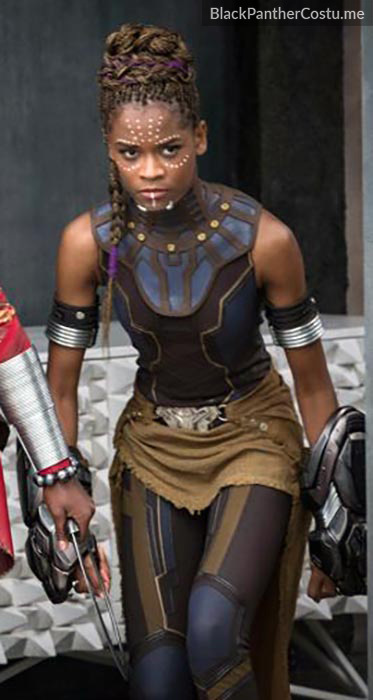 Buy this replica Shuri costume. 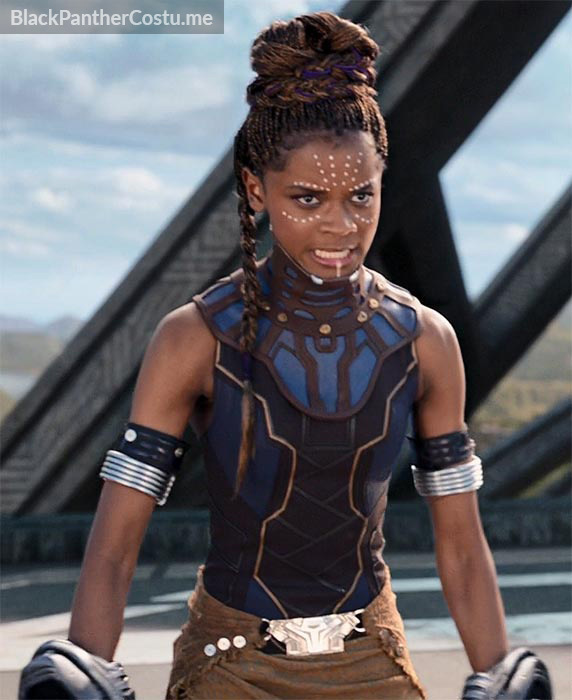 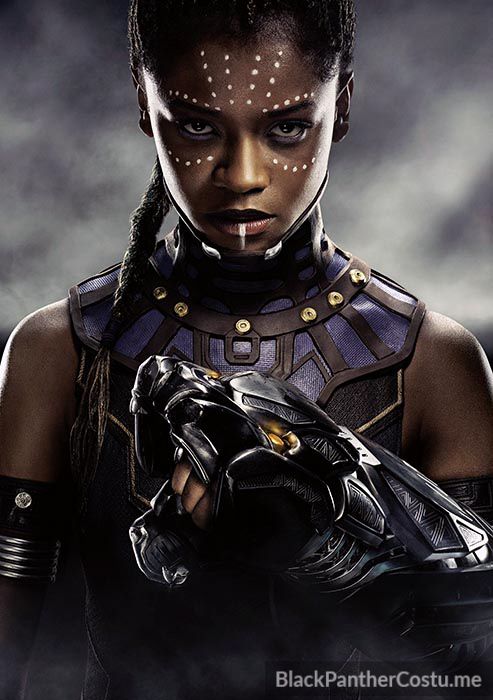 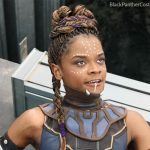 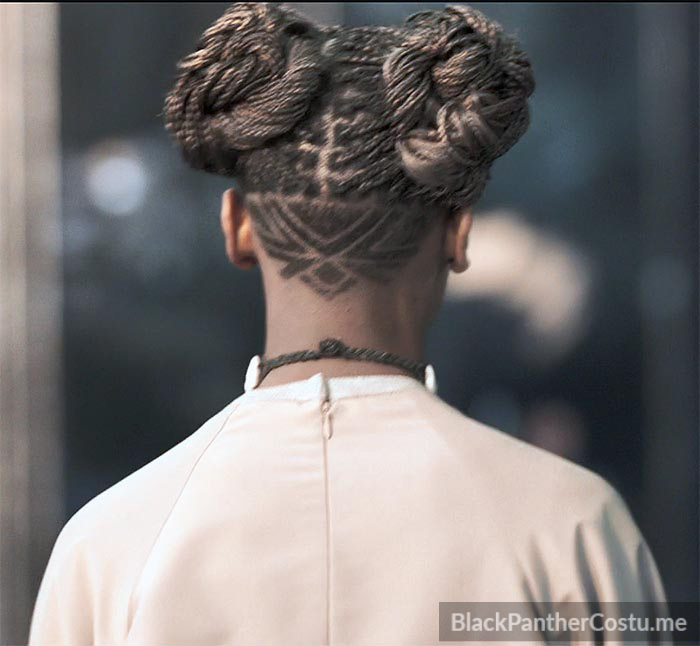 “When we first meet Shuri in the movie, we learn that she is bored with tradition. 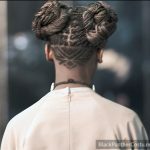 She designs the new Black Panther suit and she’s the head of the Wakandan Design Group, so I knew it was important that we really try and think outside the box for the character. Not only did we need to think outside the box in terms of what Marvel was doing with nanotech and vibranium, but we also needed to contextualize what it meant and what it looked like to be forward-thinking. 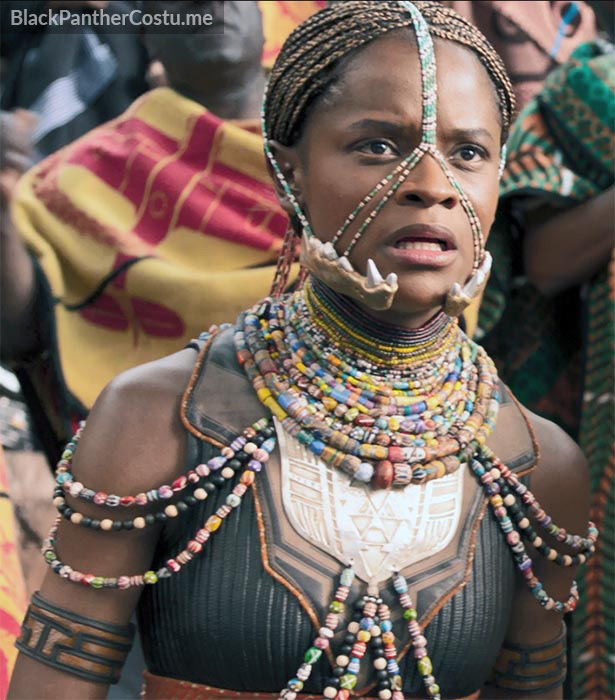 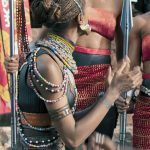 “When we see Shuri at the airstrip, she talks to her brother and he teases her about having to wear a traditional costume at Warrior Falls. 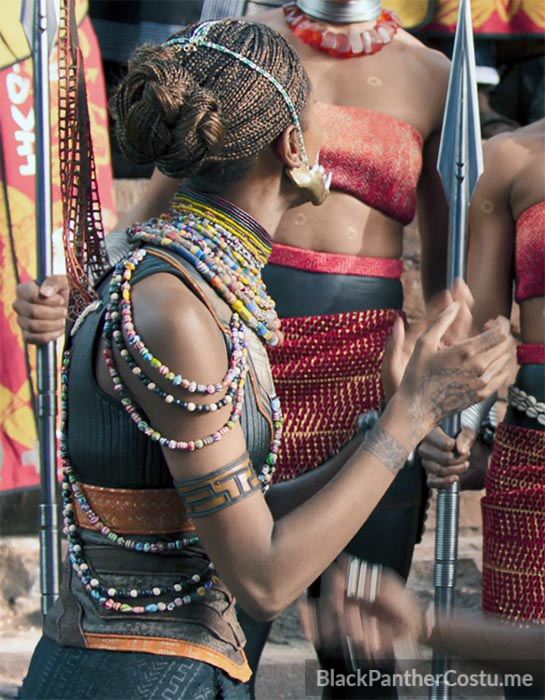 Then, when we see her at Warrior Falls, she says, “Can you hurry up, people? This is very uncomfortable.” I feel like that [dialogue] allows audiences to understand the character. 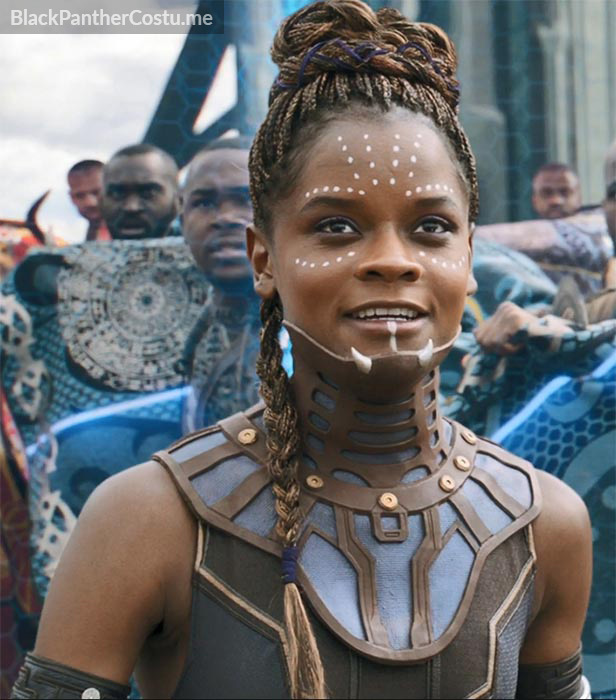 She’s saying, ‘I know I am a princess and I know there’s a place for tradition, but I’m moving on from that.’ She also tells that to everyone when we first meet her in the lab, too.